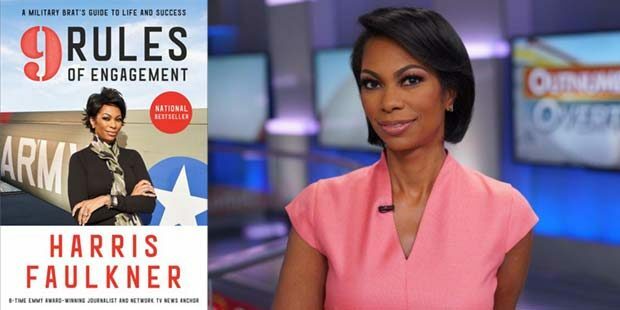 “9 Rules of Engagement” by Harris Faulkner brings to the forefront the lessons she learned growing up in a military family, which can be applied today. She pays homage to the military ideals that shaped her, showing how everyone can benefit from their wisdom. The Emmy award-winning news anchor of “Outnumbered Overtime with Harris Faulkner” and co-host of the talk show “Outnumbered” on Fox News Channel uses the skills she emphasizes in the chapter “Staying Ready.” Anyone who has ever watched these shows quickly realizes that she asks the formative questions, never allowing a guest to spin false narratives. The chapter “Recruiting Your Special Forces” shows the importance of being surrounded by supporters. In speaking with Faulkner, it became obvious that she values integrity in a person. “The military integrity and credo gives us that clutch,” Faulkner said. “I understand how difficult some things can be. But those serving know when things fall apart military brats show their resilience. For a little background, in the book, I refer to it as an enduring term standing for Born Raised And Transferred. I think it is the military saying thank you to us kids for having grit too. 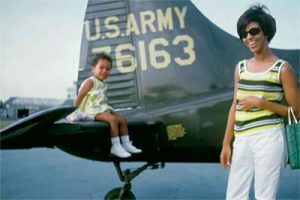 Three-year-old Harris Faulkner with her mother in Ludwigsburg, Germany. She says she loved the view from the flight control elevator of her father’s airplane. It would be nice if politicians put this quote up in their office where they must stare at it each and every day. The “Camouflage” chapter has a personal anecdote. She speaks of how she watched her dad polish his black boots. Anyone who reads this book will understand how Faulkner has respect, gratitude and pride in the military. It is a story of courage, love and duty.